It used to be a big faux pas to style leggings with sneakers for any occasion other than kettlebell squats. Nowadays, leggings make up an integral part of our daily outfits for all seasons – especially winter. Therefore, I thought it would be a grand idea to give you guys some tips on how to style leggings with sneakers, in a dressy way. This outfit is perfect for running errands, going for a casual lunch and yes, the gym. So, how did I put this outfit together? Well, for starters, I picked a pair of leggings that are quasi-dress pants. Seriously, the waiting list for these puppies is HUGE. They are the Throw and Roll leggings by ADAY. Also, they’re available for pre-order so if you’ve been wanting to get your hands on them? Now is the time! I mean, with all the different types of leggings out there, you don’t have to settle for cheap quality (ahem, see-through). Another fave brand of mine when it comes to “wearable” leggings is Olympia. I live in my Olympia motto leggings. They’re available in Canada at HEMM.ca. Choosing which sneaker to pair with your leggings is in fact, brain surgery. Don’t let anybody tell you otherwise! I arrange my sneakers in nice little rows and pick them out with the utmost care. (See cankle post). In this case, I wanted to channel some major nautical vibes and contrast with my all-black outfit. So, I picked my TommyxGigi white leather sneakers. The dark blue accents on the shoe help to soften the overall flow of the outfit so it’s not too staccato. Or at least that’s how I feel about it. What do you think? Lastly, I would choose an accessory in a unexpected neutral like silver! Furthermore, I’ve gone with silver in both my shades and my bag. I mean, who doesn’t love a silver bag?!?! My Marc Cain bag is just so much fun (even though it hardly fits my iPhone 6 Plus), I still love carrying it. The sunglasses? Well, I have a confession to make. I think I stole them from my stylish guy friend, Dustin. Oops!!!!! I mean, they look great though, right? Totally worth the five-finger-discount. 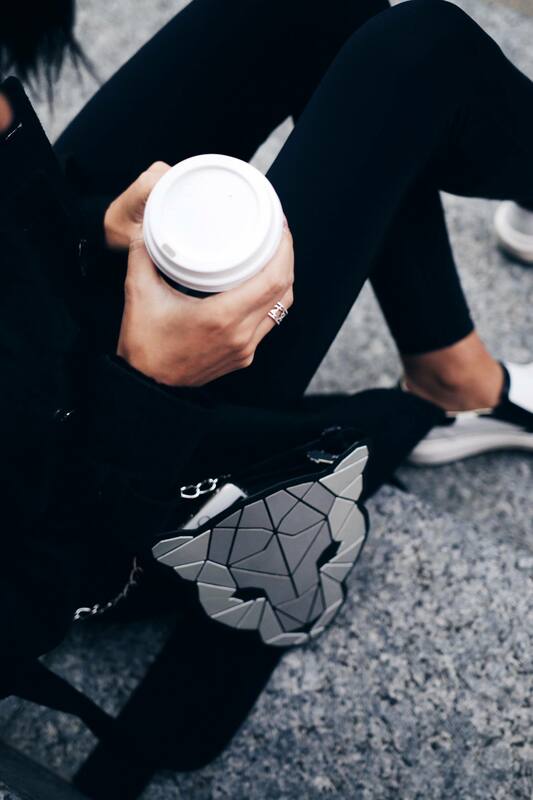 How do you style leggings and sneakers in the winter? I’d love to know your style tips and if you have any questions about attempting this look yourself, which I highly encourage, ask me anything about it!!!! So, leave a comment below and let’s chat! Exactly legging plays a large part of our outfit idea in winter! Thanks for the advice!